This is a good trick, and suitable for onigiri, rice croquettes, supplì... anything really, works with cold and hot rice (the best thing for hot rice is that you don't even burn your hands!!). as long as it is short grain, Japanese of Italian style rice (i.e. for sushi or risotto). In no time you will have lots of perfect little rice balls, just look here, it takes 30-40 seconds! And where did the egg capsule came from? Well, today it was Easter so we had an egg hunt, breakfast with eggs (real and chocolate) and since we are Italian and for us a Easter egg MUST have a surprise inside, the kids got Kinder Surprise eggs (the only Easter eggs in New Zealand with a surprise inside). 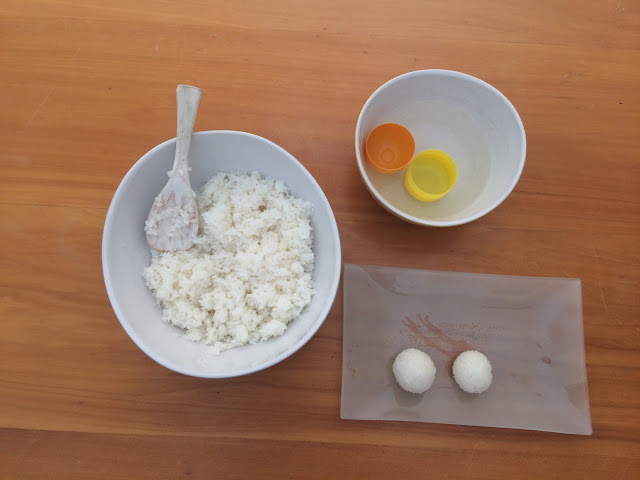 I used the same trick with smaller Kinder Surprise capsules, but they make very small rice balls (ok for canapés, but not much else...) so I quickly took my chance and used the bigger one from my daughter's egg.